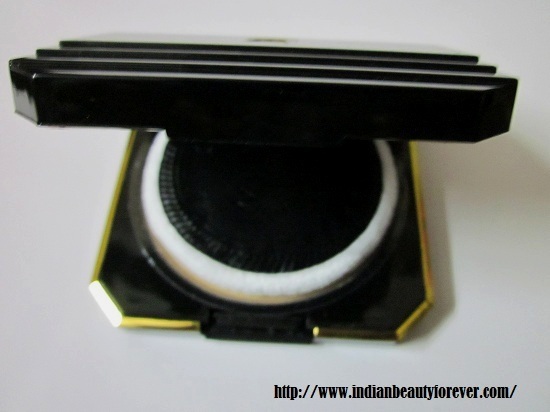 I will review a compact which I have been using a lot these days due to its light texture and mattifying formula. 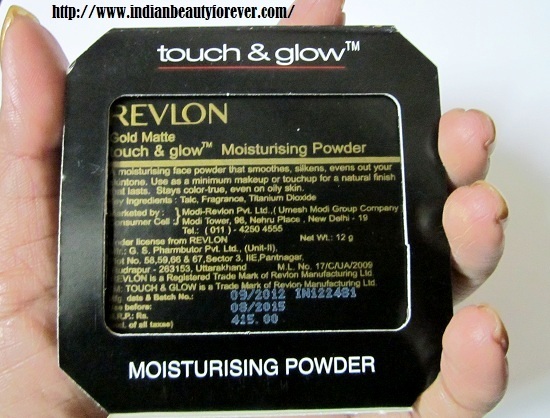 It is Revlon Touch and Glow Moisturising Compact Powder. I got the shade Gold Matte. This is from there Touch and glow range. I also got their foundation but sadly it wasn't upto the expectation. 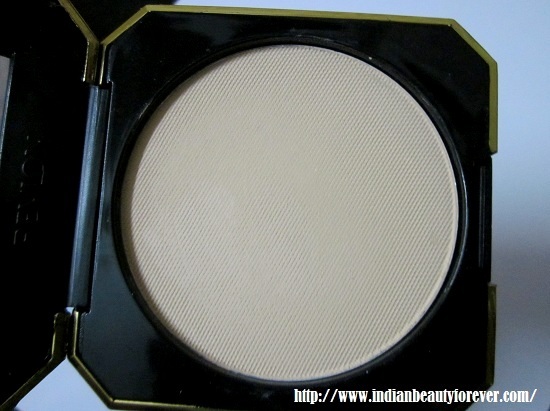 Price: This Revlon compact powder price is 415 INR for 12 g which is like huge and will last for very long time. It has a shelf life of 3 years. Ingredients: Only key ingredients are mentioned which are talc, Fragrance and Titanium dioxide. What about the rest?? Experience: I really like compacts as they are very effective in getting a matte skin look when you have oily skin. Moreover, if you are a minimum makeup person then you can wear compacts over your tinted moisturizers or BB creams which are like a rage these days. I use my Garnier BB cream most of the times and over that I use compacts to achieve a matte look. They can also be very good to set your foundation. 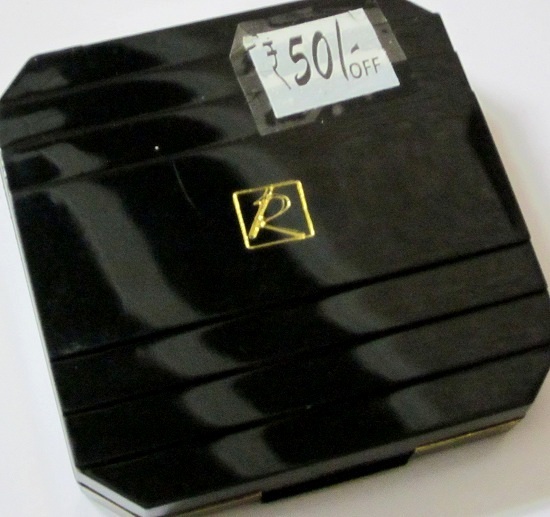 This Revlon touch and glow compact has a black plastic body with gold lining on the edges. It has a mirror and a powder puff inside which has two colors i.e. black on the back and white, pretty it looks !! I like its puff as it really helps getting the product evenly on your skin and doesn’t pick too much product. It’s soft and easily washable. Yup, you should wash it after sometime or should change it as when you use it on your face, all the oil gets trapped inside it. I find it a little difficult to open, may be due to its lock. I got this shade in Gold matte which is a beigish color with very faint yellow undertone which makes it suitable or fair skin tone. It looks light in the pan. However, you can check your exact shade at the shop or counter as I am not sure how other shades will be? pink toned or yellow!! 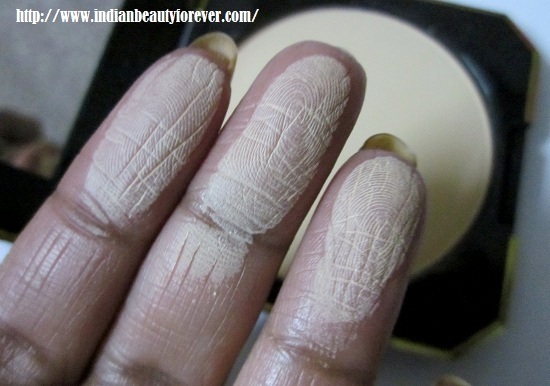 I think there is a shade Earth matte for dusky skin tone. It has a very mild fragrance or rather neglible. It has a very light texture which isn’t chalky or drying. I like the fact that it doesn’t make my skin powdery or as if I have applied loads of or visible amount of powder. This Compact powder will be suitable for not only oily skin but dry skin as well since it does not have a drying formula. 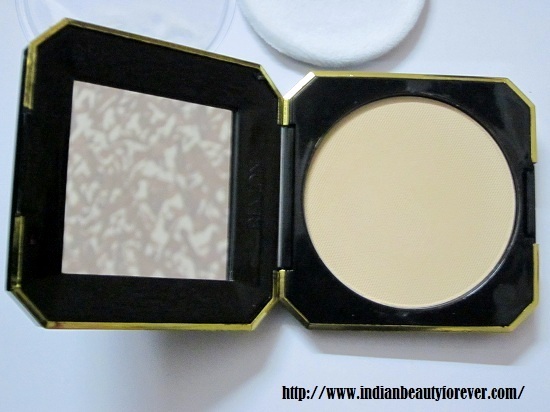 Here I would also like to mention that I have earlier used Lakme perfect radiance compact which was similar to this Revlon one in terms of texture and light weight formula. So, you want something cheap and pocket friendly then you may try that as well. 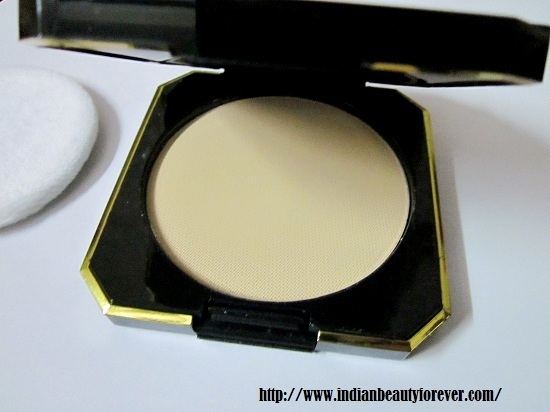 I will soon do a review on the Lakme compact so that you can judge and see the texture. Overall, I would say, I really like this product. Not sure whether I will repurchase it or not as it will last for long. By the way this pack was at a discount of 50 Rs off. 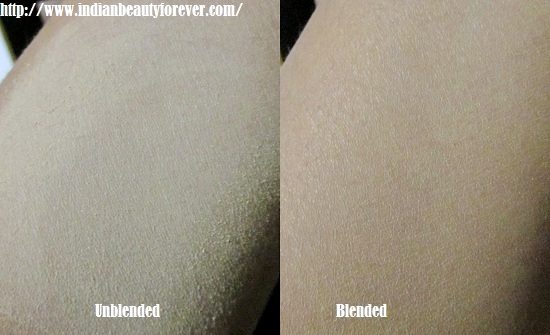 In the swatch below i intentionally applied more so as to show you how it blends and the texture afterwards. Easily available online, drugstore or counters. Selecting a shade would be easy as it is available in 5-6 shades. Nice packaging with a mirror inside. Puff is smooth and soft. 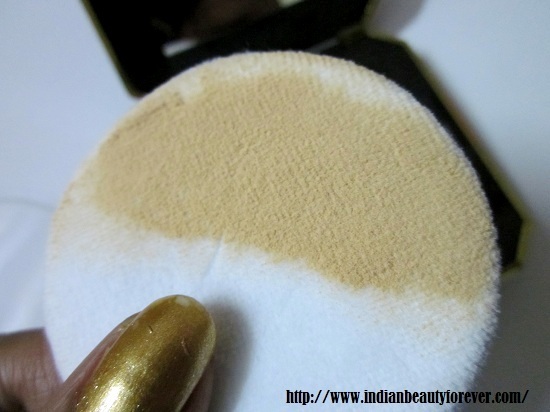 It doesn’t dry out the skin and make it look powdery. Complete list of ingredients is missing. My take: I will highly recommend it as it indeed does a very good job by giving a light weight, non powdery/chalky finish. You will love it. Its really great especially for the oily skin. I used this long time back when in school :D It lasted me soo well but I broke it by dropping it :( it was really good but somehow had forgotten about it :O thanks for reminding! Great review :D I've used this and it's really good. Excellent review, Niesha. Loved your take on it. Looks great and loved the pics. Indeed a very good compact and very nicely explained review. I have used this once and liked it. Thank you Gagan, It's my favorite these days. Great review ! Love how you have even mentioned the BB cream. And blending makes so much difference, very clear from your pictures. Your newest reader via GFC!